You Save $$$$ when you book your kayak rental online! Renting kayaks on South Padre Island can be a great adventure for both friends and family. You can rent kayaks from Air Padre for as low as $30 per 2 hours. Since the sun is usually shining, it is a great pastime activity that everyone can enjoy while visiting the island. The shallow and clear blue water of the Laguna Madre Bay make seeing marine life easy. The South Padre Birding Center is also just a short paddle from the docks, where hundreds of species of birds are easily viewable in the estuary. Kayak rentals at Air Padre are easy for all. Our shop is located on the main Padre Boulevard with waterfront access directly behind the shop. No heavy lifting is required, as all of these kayaks are set up and ready to go at the waters edge from our private boat docks. Just show up, put in, and head out to have a fantastic afternoon paddle. 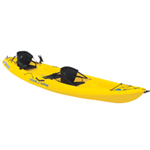 Life preservers and paddles included along with your kayak rental. 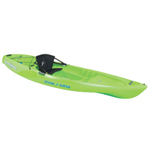 We have single kayaks, double kayaks, triple kayaks, glass bottom kayaks, surf kayaks, and fishing kayaks available for rent seven days per week. Rent single kayaks to cruise the bay solo. Be your own captain, and go where you want with nobody else to fight with. Single kayaks are wide and stable. Rent glass bottom kayaks and view the ocean floor. These single person kayaks are equipped with a glass viewing portal between your legs. While kayaking in the ocean or the bay, you can look down and see the marine life flourishing! Ride the South Padre Surf on our brand new surfing kayaks. These single seater kayaks are specifically built to ride waves. Open kayaks, built very light and easy to carry by yourself. Grab a friend and explore the Laguna Madre in our two person kayaks. The tandem kayaks are meant for cruising the calm clear water on South Padre. The seating is open and there are hatches to put your personal items in. Rent a single fishing kayak and head out into the bay on our world-class fishing waters. Red fish, speckled trout, flounder, and more! Rent a fishing kayak and head out into the bay on our world-class fishing waters. Red fish, speckled trout, flounder, and more! The fishing kayaks come equipped with rod holders, bait bucket hatch and two additional storage hatches for all of your lure and tackle needs. Eco-tourism has been hot for the past decade and South Padre Island has many opportunities to enjoy the outdoors with minimal impact. Kayaking is something that any one can enjoy even if you can't swim. South Padre Island offers many different adventures for paddlers including fishing, bird watching, dolphin watching, surfing and just general cruising. 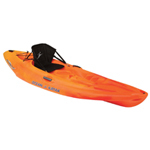 Regardless of you age or fitness level you can find something do to with a kayak. The endless shallow waters of the Laguna Madre are stock full of tasty Red Fish, Speckled Trout, and many other types of fish. A kayak can easily get you into the super shallow flats where the Reds are often tailing. The stealthy nature of a kayak makes if easier to sneak up on the fish than a super expensive flats boat. Surf fishing and shark fishing are also very popular amongst anglers and with kayak you can paddle out to put your bait exactly where you want it. If you have every tried casting in the surf you know you always wish you could get it a little farther out. Once you've paddled out and dropped your line just paddle back in a crack a cold one. The newly constructed birding center on the north end of South Padre Island is attracting bird lovers from all over. South Texas has many unique native species of birds and it is also at the bottle neck of north-south migration for birds from all over the continent. The Birding Center is located just minutes away from the south flats and boat ramps making it very easy to enjoy the scenery from the water. There are many places you could encounter dolphin while paddling the waters around South Padre Island. Sightings have been reported along the small canal running along the west side of the island as well as under the bridge and in the shipping channel. 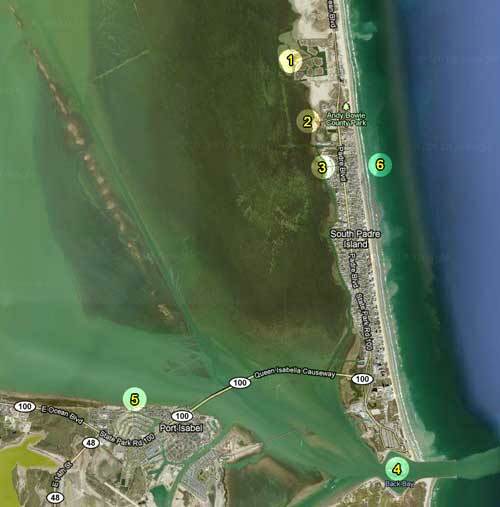 However on of the most popular areas to find dolphins is closer to the jetties on the south end of South Padre Island. Have you ever dreamed of surfing? Surfing is one of the hardest sports to learn to to well and takes a serious commitment. However kayak surfing is quite easy even for those who are not in excellent shape. If you can paddle hard for short bursts of 10-20 seconds then you are in. Many manufacturers of kayaks make models specific for surfing. These usually feature a more curved bottom (rocker), molded shapes designed to channel the water and narrower cut to reduce weight. South Padre Island is a great place to catch your first wave. Whether in the waves or the bay or the protected inner canals on the north end South Padre Island has a kayak adventure for anyone wanting to get out on the water and enjoy the day. Fishing, surfing and enjoying nature from a kayak offer a budget friendly way for individuals, couples and families to bring home great vacation memories. Dolphin Cove - swell but no breakers, DOLPHIN!! Click on the kayaking pictures below to see larger views of the fun that can be had on South Padre Island, Tx.